Hot Sticks are beginning to annoy me. Yes, it's true. They still give a great authentic curl...I use the heck out of them. And that is the rub. Because the more I use them, the more 'limber' they get. And the more 'limber' they get (especially the small ones), the more they 'pop open' while they're setting. For a while, I could get by with just using a duckbill clip to 'reinforce' the joint of the roller, so it couldnt slide open. Now, even that seems to be failing me. Supposedly, these get good and HOT...and since my old set from the 1990's are also Remingtons, I can vouch for that. But the kicker is that these are going for from 50-80.00 on Ebay. Supply and demand, you know? Do I really want to pay that? Not really. But I have to admit, it does make me want them even more. Do ya'll remember these? 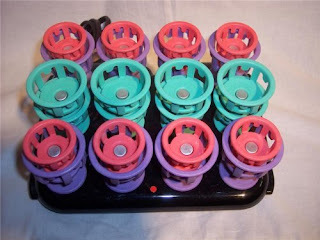 Clairol Lock and Roll Rollers! I remember using them religiously (around the time I attended Bryan Adams 'Wakin Up the Neighbors' concert...haha). They got really hot and they provided small curls, from what I remember. They're also a 'hot item' among the pageant crowd, going for around 30.00 or so on Ebay. I'm in a pickle. But I'm sure you'll see one or the other of these in some upcoming videos because the Hot Sticks are bout to end up in my neighbor's yard! I got some hot sticks a few months ago that have ridges to help get... something. I don't think the ridges really do anything. HOWEVER, they do have a groove in them that the loop clicks into, so they hold better than the smooth ones do. I got mine at a local Walgreens. I've been wondering what brand of hot sticks you used for a while. I purchased some a while ago and the curls would fall out in a half hour. I ended up returning them. I have that set! They are the envy of my girlfriends. I bought them at the Goodwill for $5 years ago after my original set (bought at Kmart [don't judge] for $20) failed. The cheap ones are out there! Keep looking! I have the Lock N Rolls and Hot Sticks. I find the Hot Sticks definitely give a tighter curl than Lock N Rolls, and the problem with Lock N Rolls is they can give a funny "bump" where the flipped over part catches the curl. They work well but do have some issues. Oh, my mum still has those Clairol Lock and Roll Rollers. I have to borrow them someday and try them myself. I use an IQ 3/4inch gold curling iron (from Sally's) and "hot set" my hair by holding hte curl in two prong clips. I have fine, thick, pin straight hair and I have not met a hot roller my hair didn't pop open or completely ignore. THis also takes away my option for a wet set, as my hair never dries over night or I don't get it wet enough to hold the curl. My hot set works great. I use a little Lotta Body with silicone heat protection serum before I blow dry. If you are interested in trying it this way email me. However, if you find a tight curl from a hot roller set I would be all over it. Good luck! Watching now with gripping attention to see which one you choose and what you make of them. It hurts so much when the hot sticks pop open if it is with a bit of a spring! I have a set of hot sticks that I never, ever use because I just don't like them. Email me your addy and I'll send them to you! Uh, what about the Caruso Hair Setter. Mine came with a dozen small and a dozen petite. I lucked out in Denver, finding 2 sets of Tight Curls at thrift stores. I sold them both on Ebay for a pretty penny, as I had already bought my personal set from Ebay about a year earlier. Even they cost a lot I think they are the best hot roller set you can use, especially for shorter hair. I use my Hot Sticks more now that my hair is long. As for the cost...yeah its a lot, but if you think about how much you will use it, and how good Remington products are (they last forever!! ), you will see they are worth the money. And if you change your mind just resell it one Ebay!! You'll get you money back for sure! 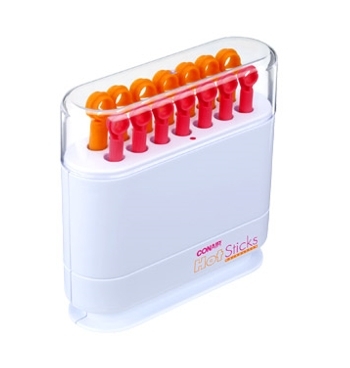 I got mine at Walmart and they are wonderful.. Ive also seen hotsticks at Sally's and Target. I like hot sticks a lot, but I admit they are a bit fiddly. I'd love to hear what you end up with! I have that Remington set here in the UK, they are really really old, and I despair of the day they give up, they really work for me, I have a short 50s set and thick hair and they're great! I am convinced my mom has the clairol lock and roll rollers hidden in a closet at her house.I need to go over there and look..because just the other day I thought how wonderful those would look for vintage styles. i wish still have my lock and roll set. but my son at that decided play with them and lost all roller.lol but i got my at thrift store. time too hunt for new one. . In the Dressing Room with Espadrilles Etcetera!